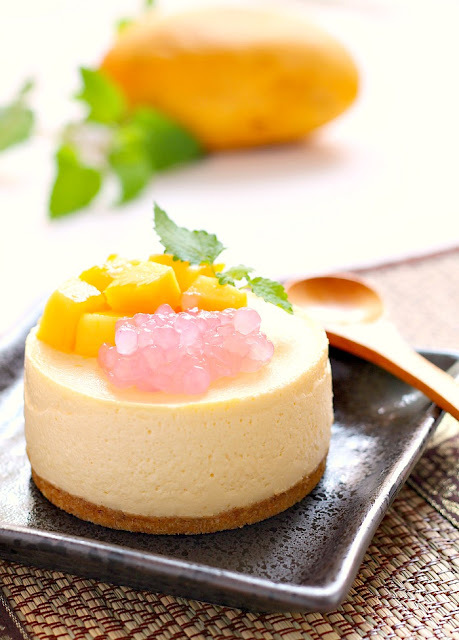 my bare cupboard: Mango-sago mousse cake "
When it comes to fruit , mango is one of my favorite and the best way to consume mango is just to eat it as it is - juice dripping from your fingers oh , don't forget to lick those fingers ! Mango season has come and gone without me noticing it - good thing that you can find some at the market here all-year round though some are not as luscious and the taste is rather hit and miss . I found some Philippine mangoes yesterday at the wet market and rather than eating all of them er nearly - I reserved one big one for this mousse . I've got this recipe from one of the free dailies here and been meaning to make this for months but since the size of the mould is not listed and couldn't find the book at the library , I filed the recipe in my ever-growing stash . This portion got a small amount of sago at the bottom so you can barely see it . For the base : Combine 45 grams digestive biscuits ( finely crushed ) and 15 grams softened butter , press evenly in moulds *** . * Cook sago in boiling water for at least 10 minutes , turn off heat and cover pot , let stand for around for another 10 minutes . Soak sago in cold water for a while and drain , set aside . * Beat cream with handheld mixer at medium speed for 3 to 4 minutes until stiff , add sugar and mix well . Add mango purée to the cream . Add coconut milk and evaporated milk , mix well with a spatula . * Dissolve gelatin in hot water and add it to the mango-cream mixture . Add in sago and pour mixture into prepared moulds . Chill in the fridge until set . Remove mould and decorate with whatever toppings you have . *** The size of the mould is not specified so I used two 3-inch round mould and 1 muffin liner . Got more extra mixture so I used 2 glass bottle , just like the ones I used for this ice cream , sans digestive crust . **** The price of raspberries here is ridiculous ! Instead I used some cubed mango and some cooked tri-color tapioca pearls ( it turns all pink though ) as toppings . Delectable dessert! Mangoes are our favourites too, luckily for us, we can buy them any day of the year! This dessert looks so, so, yummy! Love the last photo, wish I could grab it out of the screen! I'm enjoying your clicks as well as the smooth mango mousse. What a soothing dessert! these look impossible to resist! Oh my, Anne! This is a picture perfect dessert...how incredibly beautiful! You've outdone yourself! Oh my goodness, I want this right now. YuM! Totally with you on licking the juice from the fingers while enjoying sweet juicy mangoes! The mousse looks divine, Anne. It has such a light and creamy texture. This looks sensational. I love the ingredients in it. I can only imagine how smooth it tastes. I'm not familiar with sago, so I guess I will have to look it up. Is this cookbook in English? I may have to purchase it. I'm definitely making this though just as soon as I figure out what sago is. Wow! 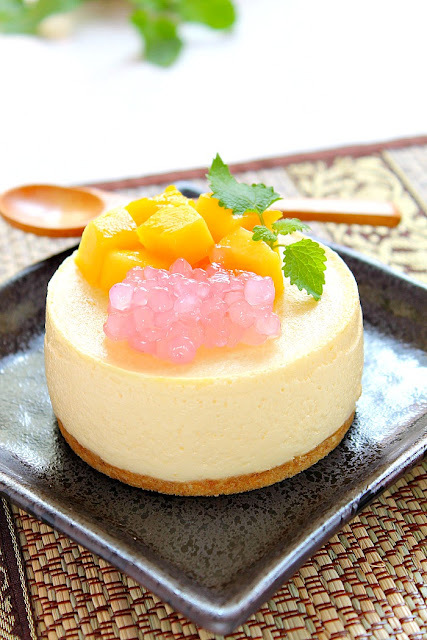 What a lovely mousse cake & I love sago too. 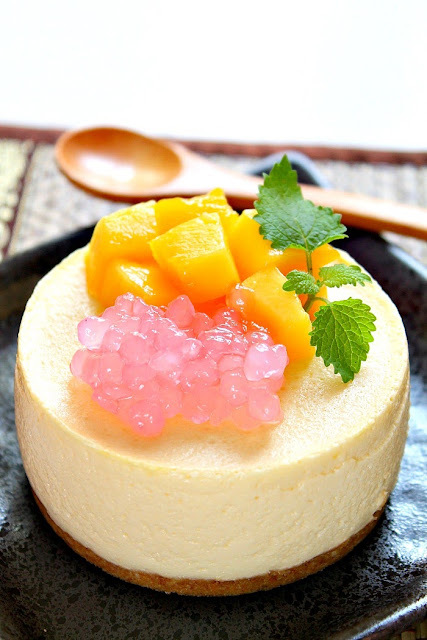 Great presentation with mangoes & pinkish sogo that look very inviting ! YUMMY! Anne, Nothing can beat Philippine Mango...the best!Your mango sago mousse must surely taste so so good:) My dream dessert for this week!! Anne, this is an interesting combination, but sounds so tempting ! I would love to try this out, when i could get over my reluctance to eat mango in any other way than just as it is! Oh, beautiful mousse cake, I especially like the pink tapioca pearls. Have a lovely weekend by the way. Oh, I love this cake with mango and coconut in it! I totally agree with all the comments,its beautifully presented on a plate and looks like a dessert from 5 star hotel. I love mango too, especially the Philippines ones. 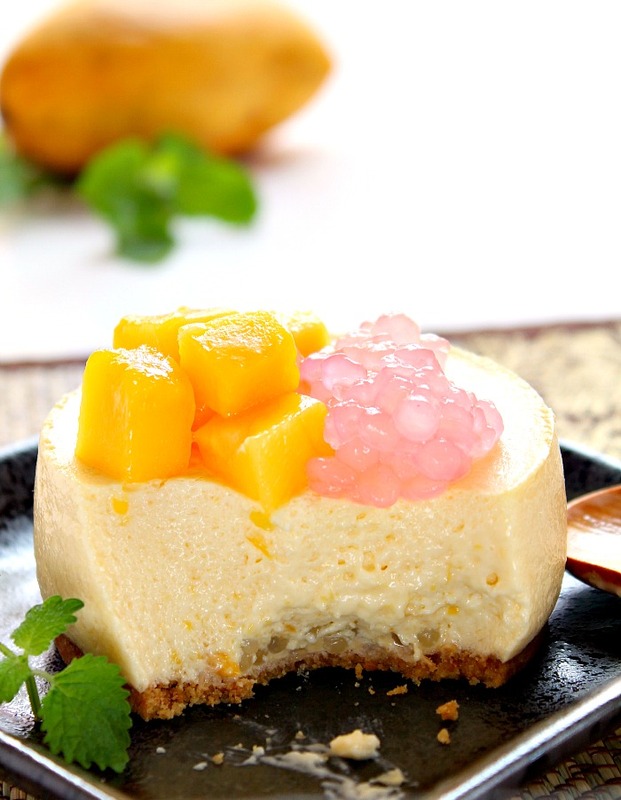 :) This little mango mousse cake is just gorgeous. As you say, perfect way to cool down in the hot weather. I've got to see if I can still get some good mangoes. I was at the market yesterday and they were all darken so I didn't get any. Gotta try an Asian market tomorrow, more chances of getting good Philippines mangoes there. hello anne! the pink tapioca pearls make it so pretty!i can see the almost hidden sagos in the mousse..LOL! i can skip dinner and just have this alone! It sounded a bit like a tongue twister saying the name of your cake... hee hee! Judging from your pretty photos, the mousse layer of this cake must be mango-licious! Nice pictures, have a lovely week ahead. Can you subsitue gelatin power instead ? And how much would you need?